Disclosure: This is a sponsored post on behalf of TriNova. However, my love of this product is all mine. The other day I walked into my 10 year old son’s room and it smelled terrible. I couldn’t figure out what the smell was. Even after picking things up off the floor I still couldn’t find the culprit. I even called my husband in for reinforcement because I just wanted to get rid of the smell. After searching a bit we finally realize the stinky culprit wasn’t a dead animal but my son’s sneakers! I couldn’t believe it! Thankfully I had just received a bottle of TriNova’s Shoe renewal spray and with a few sprays his shoes went from condemned to allowed back in the house. 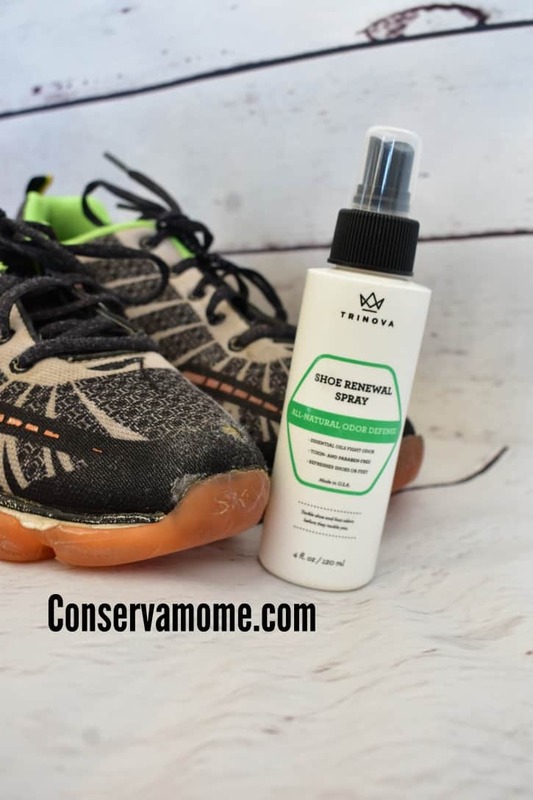 Best of all TriNova’s Shoe Deoderizer uses a blend of natural oils like peppermint, tea tree and thyme, to create a pleasant aroma that combats odors at the source. 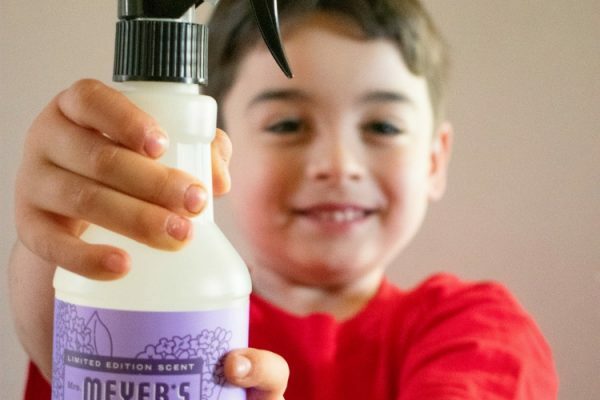 The spray is 100% plant based (no chemical additives or preservatives) and safe enough, you can even use it on your feet! Which I might just do on him when he’s not looking. My 10 year old also has his Sunday shoes that constantly need to be cleaned. Because he’s also an Altar Server his shoes need to look his best. Because he’s in charge of shinning them I don’t want him using a chemical that’s harsh. So I was blown away by TriNova’s Shoe Cleaner All he has to do is spray it onto small brush (included) + scrub. He’s able to get rid of stains and dirt fast without damaging the shoe surface. You can clean 100 pairs of shoes with one 8 oz bottle. Check out his shoes below. The left one was “TriNovaed” while the right one wasn’t. Isn’t it great? 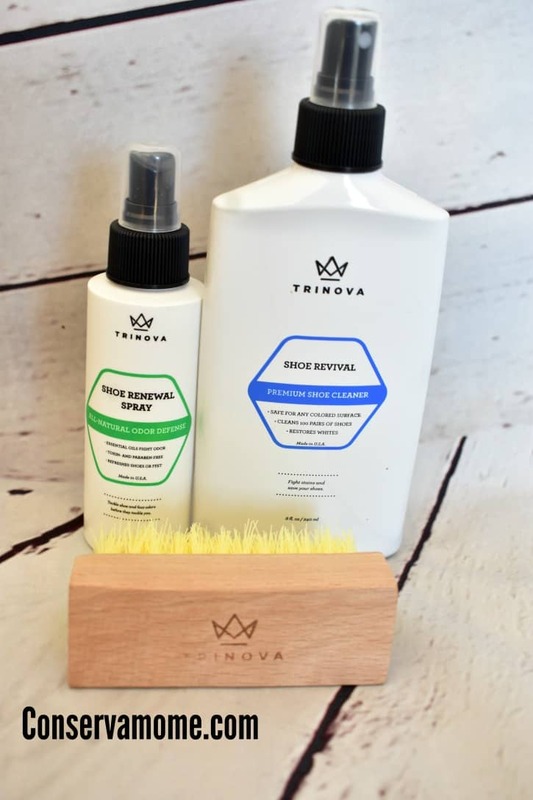 TriNova’s shoe cleaning products, getting rid of dirty and sticky shoes is easier than ever. 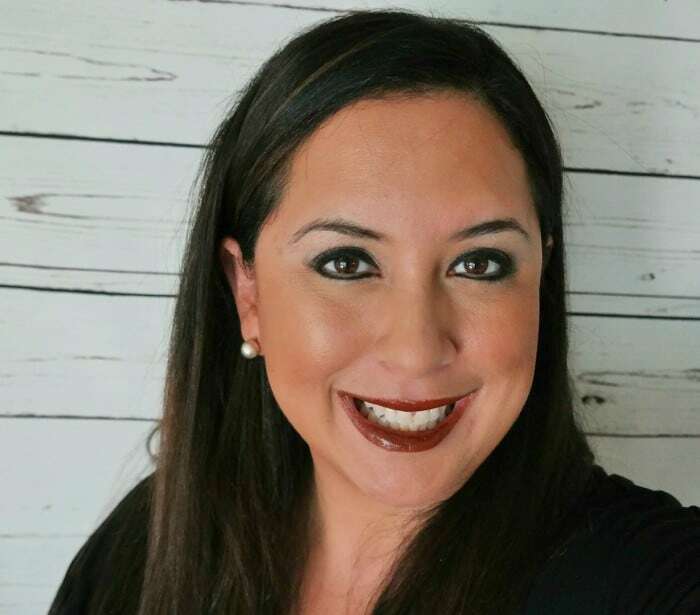 TriNova is a brand offering cleaning + care products for everything you love–from your shoes to your leather purses, couches, wood floors, granite counter tops and more. Their products are U.S. manufactured and never tested on animals. 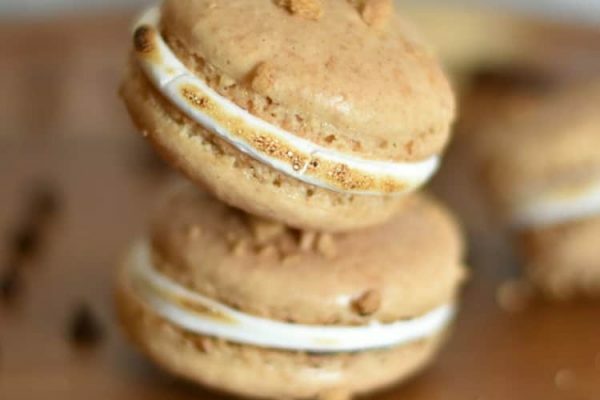 Ready to try them out? You can purchase them on Amazon to see how well they work for you. Now for the Best part! One Lucky winner will get these two great products to try out + a $50 Amazon Gift card! To enter just head below and fill out the Giveaway Form. 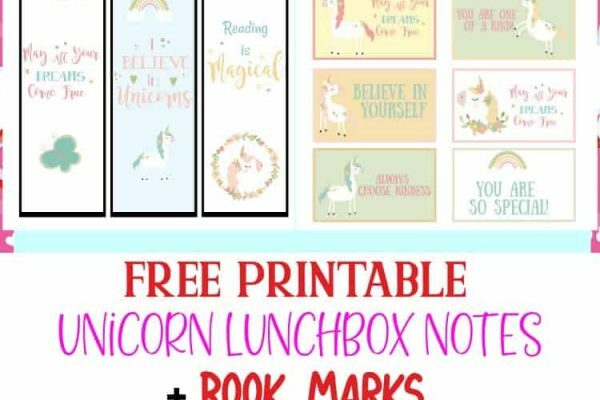 Giveaway is open to US only and ends on 3/31 at 11:59pmEST. Good luck!! I will refresh mine! they stink when I come back from the gym. I have 3 sons and a husband so I think I have a good pick of stinky shoes! my boyfriends shoe could really use this product! My Hubby and my 4 year old son have the same stinky feet. Both of their shoes would get good use out of this. My fiance’s stinky work shoes! Yuck! My 12 year old daughter’s shoes ewwww. Maybe even her feet themselves lol. Thanks for the opportunity. my husbands shoes. his work shoes and his house shoes are the smelliest. I think I will have to be honest here and say that everyone in the family will benefit from using this product. I have one pair of shoes that I wear without socks that my feet get very sweaty in and therefore very stinky and I for one do not like the smell of my feet after wearing these shoes so I try to remove them away from the family but sometimes I don’t get away with it. Ha! Some old musty shoes that have been sitting in the basement all winter long. I would refresh my 3 year old and my 6 year olds shoes! I would also freshen up my hubby’s golf shoes!! Mine and my hubbys work boots and shoes! This would be used for my gym shoes and my son’s shoes. My flats, and my son’s stinky boots! My sixteen year old daughter’s shoes for sure. Poor dear has had seriouslt stinky feet her whole life. We played “phew wee stinky baby feet” but they really were a little. Doctor said nothing wrong physically though. I will refresh my shoes and my husband’s shoes!!!! How do I register I don’t see anywhere to enter anything ??? I would do my grandsons when I watch him after school. His shoes sure get wet and muddy at recess. 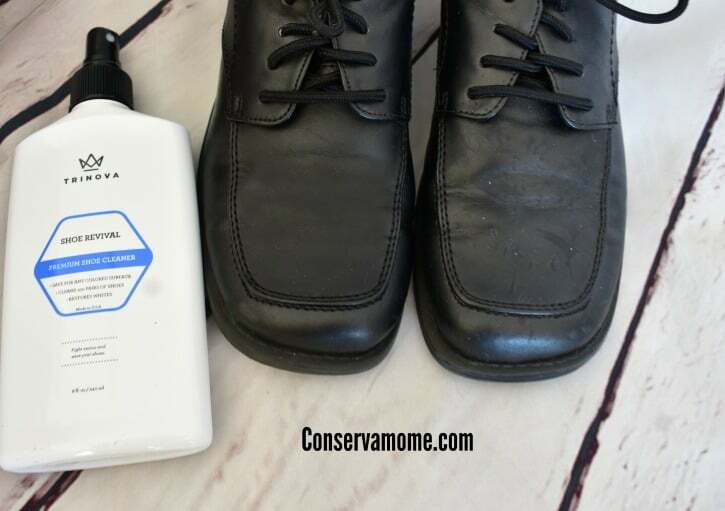 I will refresh my husbands stinky shoes will with Trinova. My husband is a contractor and his work boots could definitely use some refreshing! My own. I wear braces and my feet swat and so my shoes stink. With a house full of boys we could all use it! My husband’s shoes could use it! I would use it on my Tennis shoes that are 10 years old. I would love to refresh a pair of black shoes I wear to work!